BUFFALO – When the Sabres examined defenseman Dmitry Kulikov as a potential trade target, the team’s decision-makers studied video of the Florida Panthers’ first-round playoff series. While the Panthers lost to the lower-seeded New York Islanders in six games, Kulikov’s performance wowed them. In critical tilts, the Russian thrived playing a No. 1 shutdown role against the Isles’ top talent. Those outings helped convince the Sabres they needed to pursue the Russian, who believes he found something extra in himself to “push forward” with the additional responsibility. That’s probably why Kulikov, who has one year and $4.3 million left on his contract, figured he was still in the upstart Panthers’ plans. When the Panthers acquired Keith Yandle’s rights last week, Kulikov was initially excited the team had an offensive defenseman in its arsenal. But three days later, the Panthers signed Yandle to a seven-year, $44.45 million contract. With the NHL Draft just a day away, Kulikov, 25, said he was starting to have doubts he would stay in Florida. Spending seven years with one team feels “like you’re on an island,” Kulikov said Tuesday on a conference call. So naturally, Kulikov felt a mix of excitement and nervousness after the Sabres acquired him for defenseman Mark Pysyk and draft picks. To Kulikov, there’s no disappointment in leaving the Panthers, who won the Atlantic Division last season, just as they appear poised to become a perennial contender. He wasn’t sure why the Panthers dished him. He believes the Panthers wanted to clear salary cap space. He never had any contract talks. The Sabres believe Kulikov will have a large part of any success they enjoy next season. They coveted a left-handed defenseman – they now have three lefties and three righties – with Kulikov’s array of talents. Coach Dan Bylsma and general manager Tim Murray expect him to skate on the first or second pair. Zach Bogosian and Rasmus Ristolainen could potentially be his partners. Kulikov said he’s open to any role. He hasn’t spoken to Bylsma or Murray yet. Still, while Kulikov had a 28-point season in 2011-12, his offensive production is usually low. He compiled one goal and 17 points in 74 games last season. Murray mentioned Saturday that Kulikov has growth potential offensively. 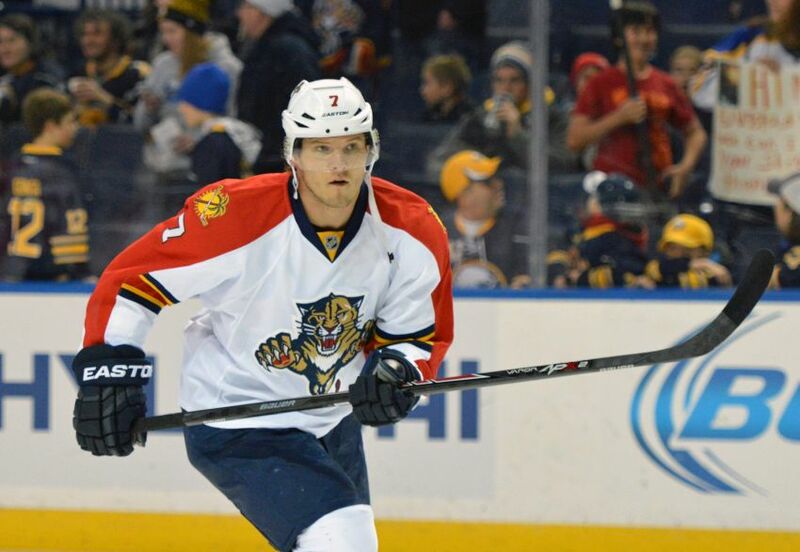 The 6-foot-1, 204-pound Kulikov said his physicality has increased over the years. He always possessed an edge, but as he became more comfortable in the NHL, he started to showcase it more regularly.